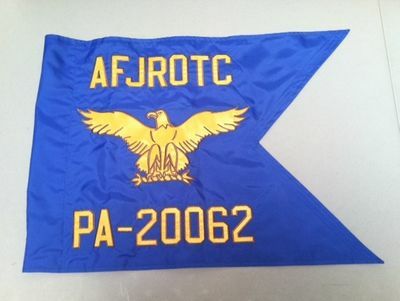 These official size regulation Air Force Junior ROTC Guidons measure 20"H x 27 3/4" Long and are made of double-ply Ultra-Marine Blue nylon fabric. They feature a sewn Eagle and the letters/numbers are sewn on both sides of the guidon. They have a Pole sleeve with a small leather tab sewn for sliding over a guidon flagpole. To order simply type in the information that goes above and below the eagle in the text boxes provided and that's it. Please allow 2-3 weeks for shipping as each and every guidon is custom made.